Green infrastructure planning seeks to protect and connect intact areas in order to avoid threats such as invasive species, while also seeking to maintain genetic diversity within the landscape. 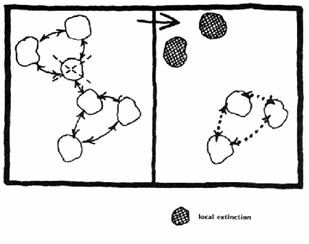 If species become extinct in one area, linkages between areas may allow plants and animals to repopulate over time. Patch or Core: relatively homogeneous nonlinear area that differs from its surroundings. Consider that the greater the number of interior species present, the greater the diversity of habitat types, the degree to which they protect stream networks, and provide core habitat and escape cover for large animals, the more it is to conserve the intact patch or core. Edge: outer portion of patch where the environment differs significantly from the interior. If there is greater structural diversity (different heights and types of vegetation) edges may also have greater diversity. 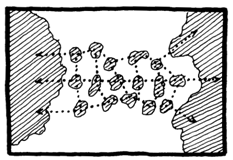 Corridor: strip of a particular type that differs from the adjacent land on both sides. Corridors may be used by wildlife to move between patches. When a corridor is broken, a cluster of stepping stones (small patches) can provide connection and alternate routes for plants and animals – size and spacing is dependent on the species utilizing the corridor. Streams are natural corridors and the width of the vegetative corridor should reflect the stream order (e.g. larger streams need wider forested buffers). From a conservation perspective, it’s important to link areas together. Species that may decline in one area due to habitat loss can move over time to other areas and repopulate. In this way, both species diversity and individual species can be protected over larger areas. Mapping and protecting intact habitats and connections are critical to ensuring species diversity. A 2001 study by the National Association of Realtors – “On Common Ground: Realtors and Smart Growth,” – showed that 57% of voters are more likely to purchase a home near to green space and 50% are willing to pay 10% more for their home. See study.